The work week is finally halfway over, hooray! And what better way to start off a new month than with a little health kick! 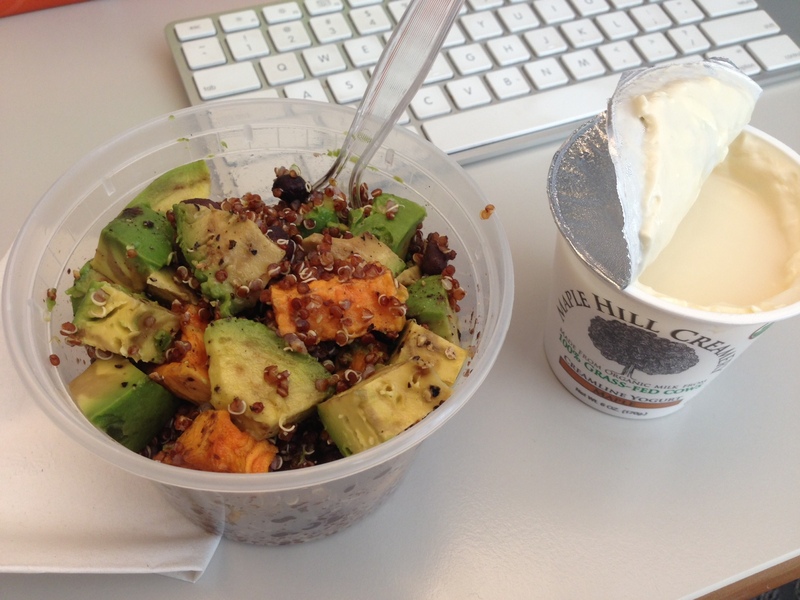 I made a tasty quinoa salad for lunch today and enjoyed it along with a maple yogurt. Yum! Here’s how to make it: combine about 1 cup cooked red or white quinoa (1/4 cup dry), 1/2 a sweet potato, diced & roasted, 1/4 avocado, cubed and 1/4 can black beans, rinsed & drained. Dress with the juice of one lime, salt & pepper and you’re good to go! All of these components keep for at least a few days, so I made 4 servings and topped with the avocado/lime juice in the morning so it doesn’t brown. Enjoy! This entry was posted in Avocados, Beans, Quinoa, Sweet Potato, Work Week Lunches and tagged avocado, black beans, lunch, quinoa, salad, sweet potato, work week. Bookmark the permalink.